INDIANAPOLIS (WANE) - U.S. Senator for Indiana Richard Lugar added his name to a list of members of Congress to cosponsor a current bill to advance the development of the Fair Tax. The Fair Tax would do away with the current income tax and the IRS and replace it with a national consumption tax on final sales of goods and services. Lugar said he called for the Fair Tax sixteen years ago when he was a Republican primary candidate for president and at the time, no senators and only a couple of house members supported the idea. “I made the point at the time that Presidential leadership was required to improve our job creating economic growth prospects, and that pulling out the existing tax code by root and branch was the way to do it,” Lugar said in a statement released Thursday. Lugar also said he feels the country is coming nearing a new opportunity to pass the Fair Tax. ‘Now, with election of a Republican House, and hopes in 2012 to gain Republican control of the Senate and the election of a Republican President, I believe that we have another chance to fundamentally change the tax code. This is extremely important because our current low growth era is accompanied by high deficits. We need to think creatively about achieving dynamic growth while simultaneously exercising fiscal restraint. 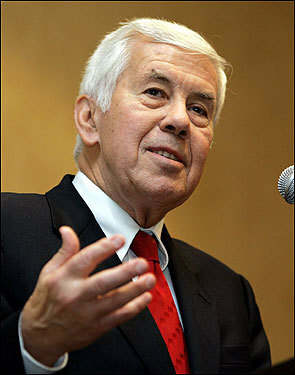 A pro-growth tax code is the first and best step toward doing so,” said Lugar. Lugar said the Fair Tax fundamentally alters our prospects as a nation. “Savings will increase and therefore individuals and American companies will have more money to invest in job creating growth, and companies around the global will rush to invest here, as well. This dynamic economic growth will expand federal revenue without an increased tax burden on Americans,” said Lugar. Lugar said the Fair Tax would eliminate hidden tax benefits to special interests and tax season aggravation and would ultimately save money for millions of families. Lugar also pointed out that individuals who currently pay almost no Federal taxes, including foreign tourists, illegal aliens and criminals, would pay Federal taxes like every one else. Lugar said the Fair Tax would also help low income workers since they would no longer have to pay Social Security and Medicare taxes currently withheld from their paychecks. "The current tax code warps household and business decisions, discourages investment, is constantly evaded, is arduous to enforce, and is disconnected from economic realities. In short, it is fitting hand-in-glove with big government spending to punch the life out of our economy. Many Americans fear that our country is going bankrupt and will lose our preeminent position in the world. This does not need to be so, and will not be, if we adopt the Fair Tax and end the inherently flawed federal income tax system, “ said Lugar. If Lugar has supported the Fair Tax for so long, why did it take him so long to agree to be a co-sponsor of the bill? I haven't heard Lugar's opponent, Ricahrd Mourdock's position on the issue. Hopefully he won't take the bait and endorse the concept. While the "Fair Tax" is extraordinarily popular among Libertarians and many tea party types, others, including yours truly, view the concept as completely unworkable. Although a 23% tax rate is suggested as sufficient to replace the federal income tax and payroll taxes such as Social Security and Medicare, a presidential commission suggested the tax would have to be as high as 34%...and that's before adding on state and local sales taxes. The assumption of Fair Tax advocates is that because people have more money to spend without income taxes, they will voluntarily pay a much higher sales tax. Balderdash. People will always want to avoid paying a tax and the bigger the tax the harder they will work at tax avoidance. The Fair Tax would end the Internal Revenue Service but cause it to be replaced with an agency every bit as large and intrusive so as to catch consumers buying on the black market to avoid sales tax and merchants who are pocketing the sales tax revenue rather than remitting it to the federal and state governmentsts. The Fair Tax turns every merchant into an unpaid tax collector for the state, with the duty of monitoring and reporting every sale of goods and services to some federal agency. And we think the IRS is intrusive. A much better idea is the flat income tax, with few, if any, deductions. That wouldn't eliminate the IRS, but it would completely defang it without necessitating the creation of yet another large, nosy federal government agency. Problems with people buying products on the black market and merchants not remitting sales taxes, problems Fair Tax advocates overlook, are not a problem with a flat rate income tax. While the Fair Tax has merit - chiefly that it would lead to people saving more - it will also lead to a huge drop in consumer spending which will result a drop in the sales tax revenue and require higher taxes. Then you have the problem that we're likely to end up with the Fair Tax and an income tax, unless the 16th Amendment is repealed, no easy feat. Lugar appears to be pandering to what he thinks the Tea Party folks want to hear. That's not exactly leadership. The "Fair Tax" is a horrible tax on consumption, thus as regressive as it gets. That nitwit Boortz loves it, and I don't trust anything about him. Still, almost anything is an improvement. If it shuts down the IRS, I'm all for it. If it unemploys hordes of tax accountants and tax lawyers, count me as a supporter. If it doesn't shut down the IRS and impoverish the transaction-cost occupations, what's the point? According to Indiana's Fair Tax Directors, Mourdock is a supporter of The Fair Tax. Lugar has known about the Fair Tax since 1995 and he is just now co-sponsoring? That is evidence of how little he really cares. This pisses me off more than if he didn't support it at all, because he is not doing it out of a place of sincerity. He is doing it because he knows it is popular with the people. I have no doubt if Lugar is elected, he will go right on being Obama's favorite senator. Mourdock made Lugar only pretend to care. America abolished slavery and then enacted the income tax, at first, to only tax the very rich. Income tax forces labor under the threat of a gun. (if you don't pay taxes, eventually the guns will come to take you to prison). Slavery, by definition, is forced labor and is immoral.